Yesterday was muffin day but today I tackled no-knead foccacia rolls from Budget Bytes. They are spectacular and easy! I left off the Italian seasoning on the top, but did brush them with olive oil. Crispy and crusty and delicious. What am I baking today? March 1st is St. David’s Day. St. David is the patron saint of Wales. He was a preacher and church founder, born sometime in the 6th century. According to Wikipedia, “His best-known miracle is said to have taken place when he was preaching in the middle of a large crowd at the Synod of Brefi: the village of Llanddewi Brefi stands on the spot where the ground on which he stood is reputed to have risen up to form a small hill. A white dove, which became his emblem, was seen settling on his shoulder.” Leeks and daffodils are also associated with St. David and are symbols of Wales. I propose baking Welsh Cakes to commemorate the day . . .
“These soft, tender cakes are a cross between a pancake and a baking powder biscuit, with elements of cookies and muffins thrown in for good measure. Sturdy enough to be eaten out of hand, they can be served plain; sprinkled with sugar (or cinnamon-sugar, our favorite); or spread with butter, and gilded with sugar or jam. In addition, they’re excellent the next day, warmed in the toaster as you’d warm toaster cakes. **Use 1/4 teaspoon salt if you use salted butter; 3/4 teaspoon if you use unsalted butter. Add the milk/egg mixture, mixing until the everything is moistened. Turn the sticky dough out onto a well-floured work surface, and divide it in half. Shape each half into a thick, 4″ to 5″ disc. Cover one of the discs with plastic, and refrigerate. Leave the other on the floured work surface. Roll the soft dough into a 9 1/2″ circle; it should be about 1/4″ thick. Be sure to lift up the dough and flour underneath it as you roll, so it doesn’t stick. Using a 2 1/2″ to 3 1/2″ biscuit or other round cutter, cut the dough into circles. Gather and re-roll the scraps, cutting until you’ve used all the dough. Fry the cakes for about 2 1/2 minutes on each side, until they’re golden brown and cooked all the way through. It’s best to fry one sample cake first, to see if your pan is the right temperature. Transfer the fried cakes to a rack to cool. Repeat with the refrigerated dough. Cut the circles, then let them warm at room temperature for about 10 minutes before frying. I remember this. My mom and my aunts used to make it – with boysenberries in black raspberry jello. It was wonderful. 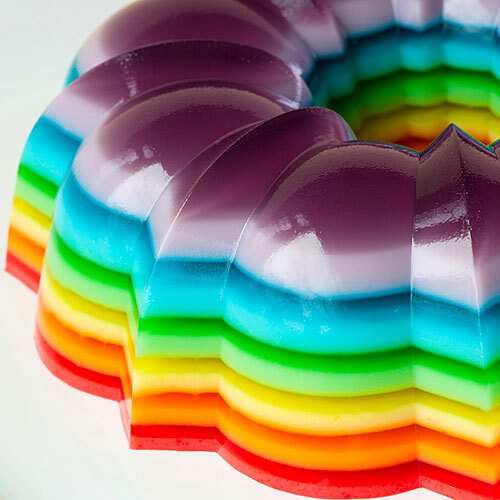 Some Jello history is here. Bacon, bacon, bacon, bacon . 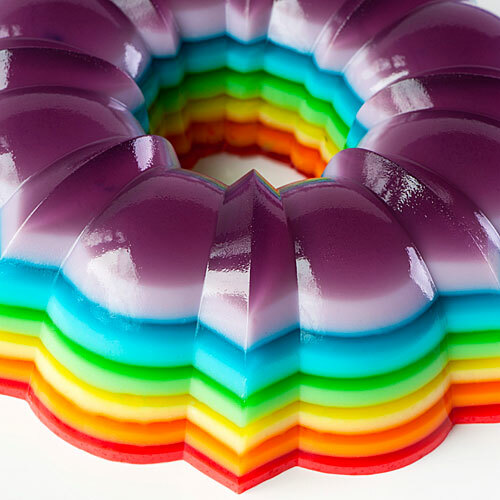 . .
After completing all the layers, refrigerate the gelatin overnight. 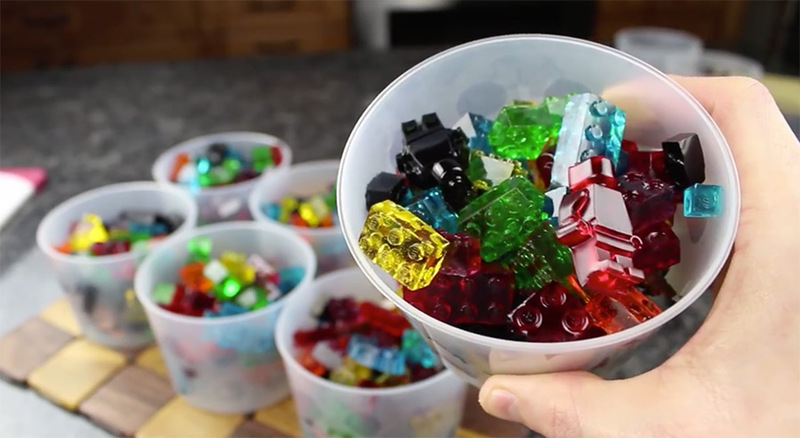 To unmold, fill a larger container or clean sink with warm water (not too hot!). 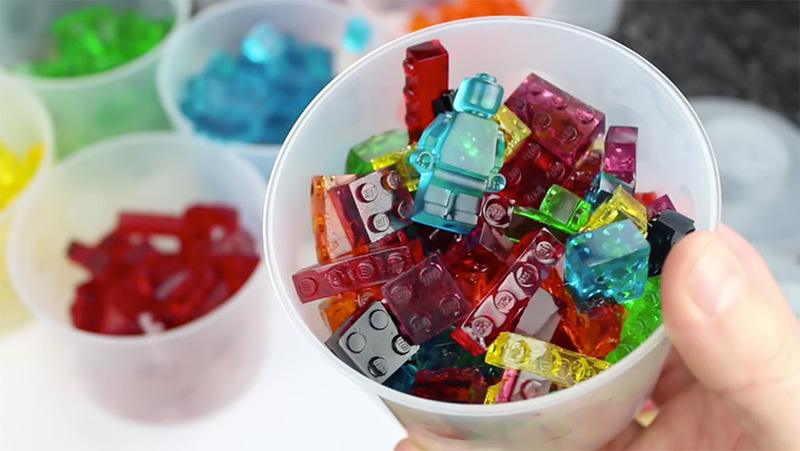 With clean fingers, loosen the gelatin around the edges of the mold cavities. Next, dip the mold almost to the edge into the warm water for just a few seconds (10 seconds worked for me). 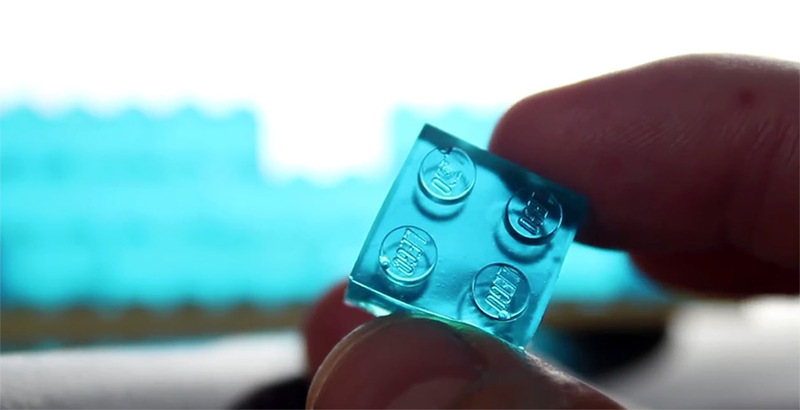 Dry the bottom of the mold with a towel and check the edges to see if they are loose. If not, repeat the dip for just a few seconds. Place your serving plate on top of the mold and invert. Voila! I did not really make this. 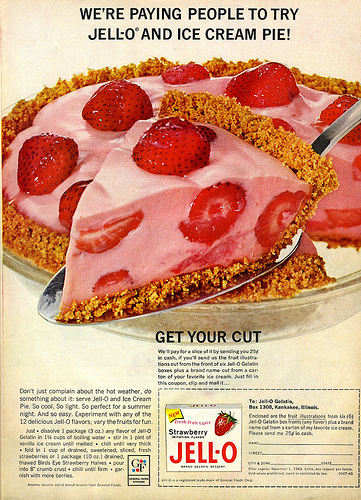 I thought I was going to, but it looks like too much work, and I am not all that fond of jello. But isn’t it great looking?